When it comes to tools, you’ll never have everything. There’s always some implement or another that would make your work so much better, but for most of us the ultimate is often just out of reach. This is why making-do has such a long and admirable tradition. Here are a few of my favorite making-do options. Hand-Held Belt Sander Doubles as Edge Sander: Many home woodworkers have a hand-held belt sander, but few own a stationary edge sander with horizontal belt travel. This is one of the world’s truly-great, unrecognized shop-performers, but you can make-do by clamping a hand-held belt sander on it’s side to your workbench, with a piece of scrap plywood in front of the belt to act as a surface for the work pieces. The exposed front roller on the sander also makes a great drum sander too. Masking Tape as a Clamp: There’s no end of clamps you can buy, but while you save your pennies to expand your clamp collection, masking tape can help you make-do. It’s cheap, easy to use and effective, especially for irregular shapes. Plunge Router as Drill Press: Lack of funds isn’t the only reason you have to make-do. Sometimes it’s due to circumstances. If you’re building something away from your shop, for instance, and have to drill a precise hole that’s exactly square with the work surface (without help from a drill press) what do you do? If you’ve got a plunge router, you’re all set. Just chuck in a straight bit in the machine, clamp the router base to your work surface, then bore-away. Accurate, Chip-Free Melamine Cutting, Without a Tablesaw: Melamine is a factory-applied finish that’s usually found on particleboard. It saves a lot of time, and it’s cheap, but you’ve got to have the right equipment to cut melamine without chipping those precious edges. 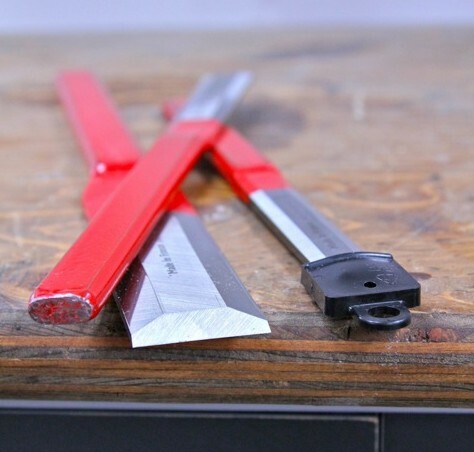 At a minimum, this means a full-size table saw with outfeed table and a $100 carbide blade that you should carbide circular sawonly use for melamine. But you can make-do without a tablesaw and fancy blade if you’ve got a router that’s at least 2 hp or larger. Rough-cut your melamine pieces with any-old saw (as long as the inevitable chipping isn’t so rough that it extends onto the good side of your lay-out lines). Next, clamp a factory-cut edge from another piece of melamine exactly on top of the lay-out mark. Chuck a flush-trimming bit (at least 1/2” diameter with a bearing on top) into your router so it’s bearing rides against the factory edge as a guide. Switch on, run the router along the work piece and you’ll end up with an absolutely flawless edge on your melamine. A better edge, in fact, than the one you’d get with a proper melamine tablesaw blade, though the router process does take longer. Check out my video on flush-trim bits in action. String Compass: Trammel points (clamped to a shop-cut strip of hardwood) are my favourite way to draw curves, but a good set costs more than $50. A piece of string tied to a pencil does almost as good a job at less than 1/100 the cost. The trick to the best results with string is two-fold: use non-stretchy string (like braided nylon line, for example), and tie the string as close as possible to the pencil’s lead. The less distance between the point where the string attaches and pencil point touches the wood, the less error in curvature will be caused by changing pencil angle.